This recipe for buttermilk corn bread is one that I have made many times and it never fails to please my guests. It is moist and just delicious with a slight tang from the buttermilk that makes it a great accompaniment to any meal. 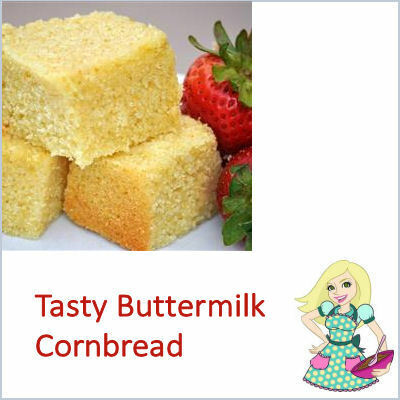 Buttermilk Corn Bread is Easy and Quick to Make. I love to serve cornbread as a side dish to so many recipes. It is wonderful with stews and soups, and perfect for any Southern style cooking. I make up a batch of it anytime I make a casserole in the crock pot. It is perfect for mopping up every last drop of gravy! I also serve it with creamy soups and also as a Thanksgiving bread. It really is the perfect blend of sweet and savory and is very easy to make. See my Pinterest boards for more great recipes. This buttermilk corn bread is the perfect choice to serve with any soup or stew based dish. It is easy to make and has a hint of sweetness to it. Melt butter in large skillet. Remove from heat and stir in sugar. Quickly add eggs and beat until well blended. Combine buttermilk with baking soda and stir into mixture in pan. Stir in cornmeal, flour, and salt until well blended and few lumps remain. Pour batter into the prepared pan.